Sooooooo…I made a recent appearance on NBC’s New Nonstop channel on the New York Nightly News show to promote my various projects. 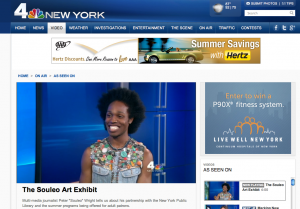 Check me out here chatting with Gus about the New York Public Library programming, my role as co-curator for “eMerge: Danny Simmons & Artists on the Cusp,” and my beloved mom and brother, Glenn “Spoof” Wright. Of course, I am styled by Beau McCall and wearing one of his custom made button vests. I guess being in love with a designer/visual artist has its perks, LOL!